I have been playing Gibson guitars for about thirty years, so it was a thrill to have an opportunity to stop by Gibson’s Nashville Custom Shop for a visit earlier this year. 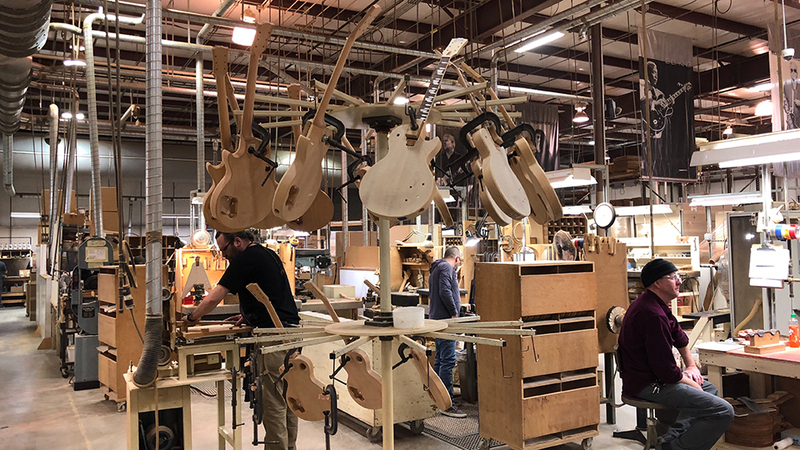 The level of craftsmanship, passion and history was fascinating to experience first hand as we walked from station to station and met with the talented men and women who build some of Gibson’s most coveted instruments. My first Gibson was a cherry red ES-335 that I bought in high school with savings from a part-time job. At the time, I was heavily influenced by Pat Metheny, Lee Ritenour, B.B. King, Larry Coryell, Stevie Ray Vaughan, Hiram Bullock and Mike Stern, among many others. That 335 was my main instrument…well, along with a jet black Ibanez Jem-series solid body outfitted with hot-rod DiMarzio pickups and a Floyd Rose tremolo – the ultimate teenage boy’s heavy metal fantasy. My more rock-oriented influences included Alex Lifeson, The Edge, Eric Clapton, Jeff Beck, Jimi Hendrix, Joe Satriani, Angus Young, Randy Rhoads and Eddie Van Halen. A few years later, while on my way to class at Berklee College of Music, I stopped by a music shop and spotted an early 1950s ES-175. I picked it up and bought it on the spot. Gibson guitars have been a part of my life for about as long as I can remember. So when the opportunity arose to visit the Nashville Custom Shop as part of a weekend centered around co-hosting a charity tasting of Masseto with winemaker Axel Heinz and country singer/songwriter Martina McBride, it took me a nanosecond to say yes. Gibson belongs to a very small group of companies that are true cultural icons. Think about Scotty Moore playing his ES-295 alongside Elvis Presley, or Jimmy Page with his low-slung Les Paul during Led Zeppelin’s heyday, or B.B. King with his cherished Lucille ES-345 and that sweet tone. Orville Gibson got his start building mandolins in a small workshop in Kalamazoo, Michigan in the 1890s. Gibson founded his namesake company, Gibson Mandolin-Guitar Mfg. Co. Ltd., in 1902. Among his many achievements, Orville Gibson is credited with inventing the archtop guitar by applying the principles of violin and mandolin design. Several visionaries have made enormous contributions to Gibson’s legacy. Lloyd Loar joined shortly after Orville Gibson’s passing in 1918. Loar designed the L-5 archtop guitar and H-5 mandolin, both of which remain in production. Well-preserved Loar-era instruments, mandolins in particular, are highly coveted and fetch prices well into six figures. Gibson Guitars was also a pioneer in the manufacturing of solid-body electrics. In 1950, Gibson President Ted McCarty and jazz musician Les Paul teamed up to create one of the most iconic guitars of all time. Interestingly, though, the Les Paul guitar did not take off commercially until the 1960s. Today, it accounts for 75% of the production at the Nashville Custom Shop. Gibson also invented the Tune-o-matic bridge, which allows the length of each string to be adjusted for a level of intonation accuracy that was not possible previously, and the iconic “Patent Applied For” humbucking pickup, known simply as the “PAF” in the modern musical lexicon. Between the 1940s and 1980s, Gibson was owned by several parent companies, including Chicago Musical Instruments and then South American brewer ECL, which later changed its name to Norlin, after ECL President Norton Stevens and CMI President Maurice Berlin. Current owners Henry Juszkiewicz and David Berryman led a group that acquired Gibson in 1986. Earlier this year, Juszkiewicz and Berryman filed for Chapter 11 bankruptcy protection. Rumors have swirled around for the last few months about who will ultimately own and lead a restructured Gibson. With that brief history under our belts, it’s time to visit the Custom Shop. 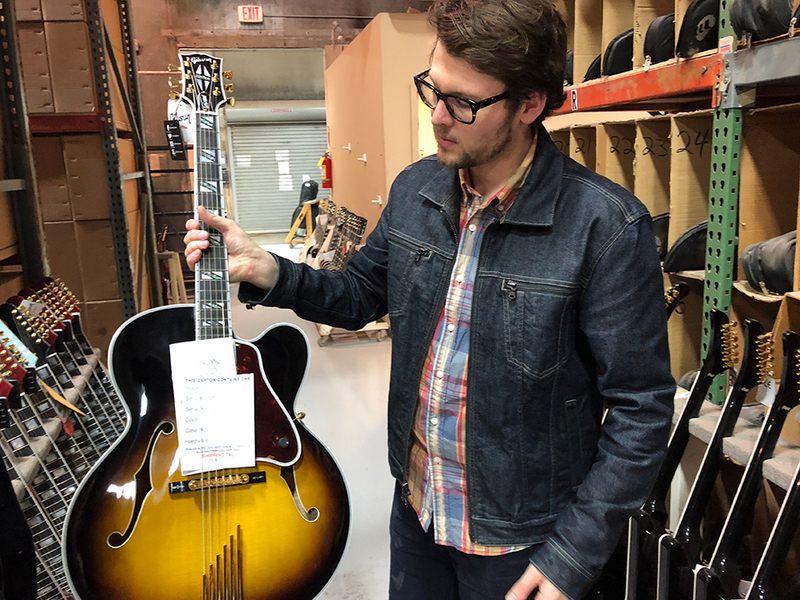 Product Specialist Mat Koehler, a self-confessed vintage guitar freak, is our host for the day. Gibson’s Nashville Custom Shop focuses on solid bodies and archtops, while other models, like the ES series guitars, are mostly made in Memphis. The Custom Shop specializes in re-issues of Gibson classics as well as small runs of custom orders. No effort is spared in recreating modern versions of the classics, from replicating technical specs to wearing-in finishes to using the same plastics and dyes that were employed decades ago. Many of the machines on the floor are retrofitted originals that go back to Gibson’s early days. The Custom Shop is very much a working factory that is not really set up for tours or visits. The energy on the shop floor is palpable. 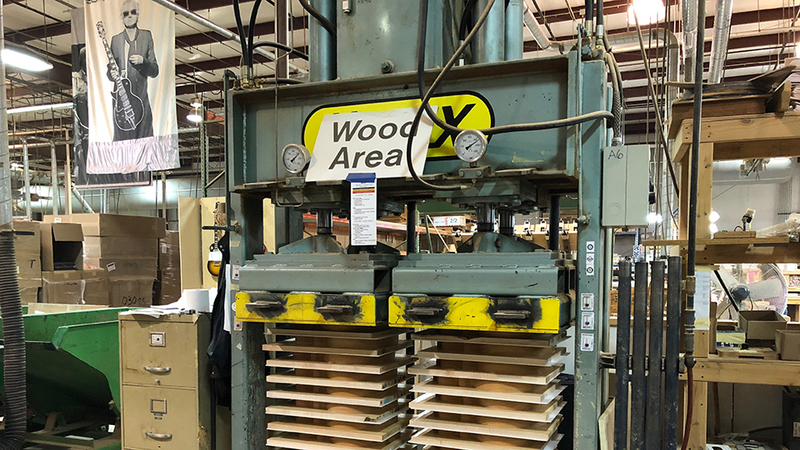 We start by taking a look at stacks of raw wood destined to become Les Pauls, followed by rough carvings and then a set maple tops being pressed onto mahogany bodies. Rough Mill Operator Richard Ickes, who has been with Gibson since 1963, is one of many veterans on the floor. 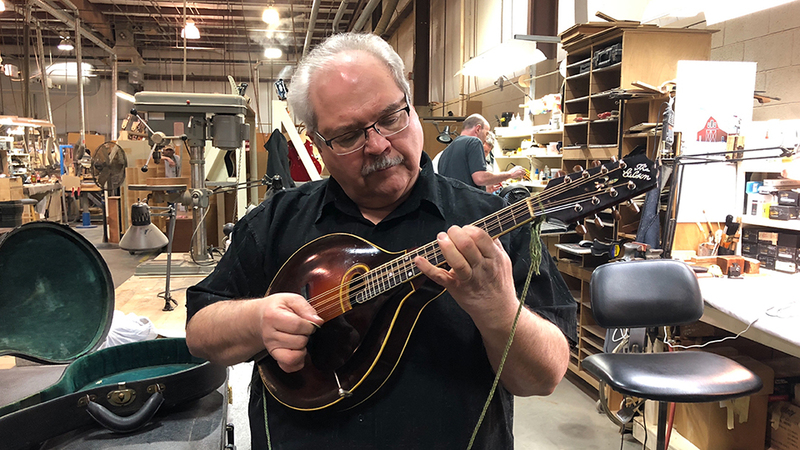 Next we stop by to chat with Master Luthier Dave Harvey, who restores vintage instruments, builds modern day beauties and also plays a mean mandolin. Harvey proudly shows us a one of a kind 1924 H2 “Snake Head” Mandola that he has recently restored from what he describes as a previously “unplayable” condition. An acoustic engineer, Harvey has the same job Lloyd Loar had when he joined Gibson nearly ninety years ago. Harvey points out that Loar’s iconic F-5 Mandolin, which was first offered in the Gibson catalog in 1923, sold for $295, while the Ford Model T sold for $275! Next up is one of the archtop production areas. 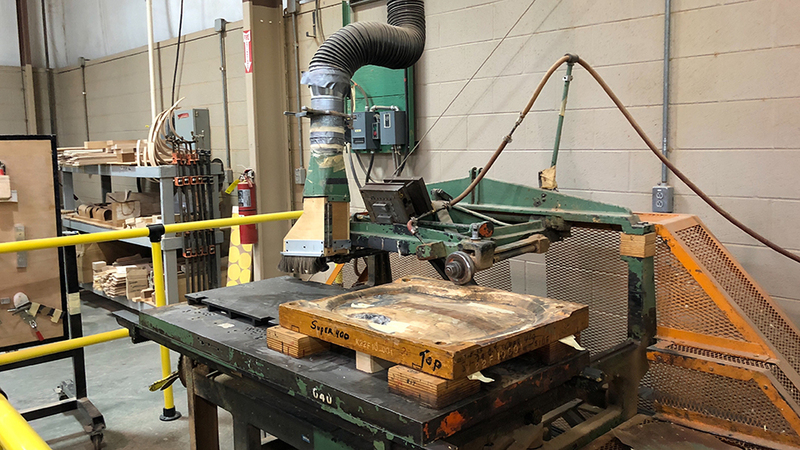 The original steam powered carvers, now powered by electric motors, are still in use, as are some of the original molds, like this Super 400 form, which dates back to 1938. The machine does the first rough carve, and the bodies are then finished by hand. Necks are carved according to a wide range of saved profiles, everything from recreations of vintage models to more modern profiles. A number of instruments hang from trees for the gluing of glued necks onto bodies, a process that takes approximately three days. In the late 1950s and early 1960s, Gibson used lanolin dyes, which are highly volatile compounds that, for safety reasons, are kept in a segregated room that is off limits for visitors. A specialized area where time-worn vintage finishes are recreated is also top secret. 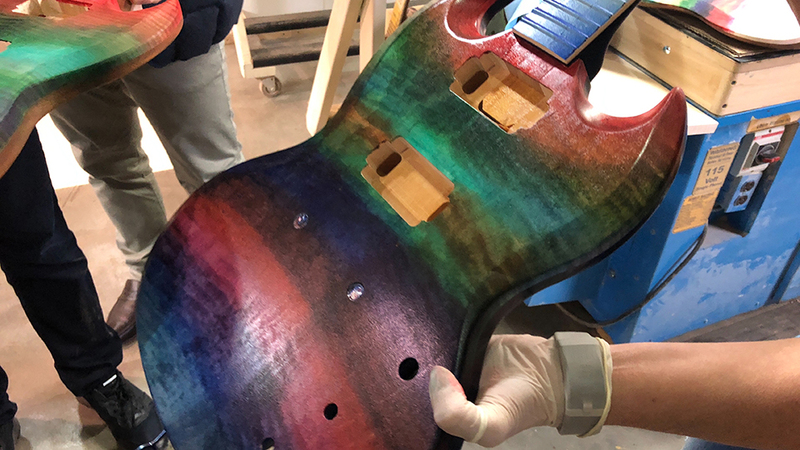 We do get to see an especially colorful set of SGs getting a rainbow finish. Finished guitars are everywhere, a rack of Explorers here, a row of SGs over there. It is incredibly fun to pick up a few instruments and compare them side by side, right on the shop floor. I could spend all day here, much to the annoyance of our hosts, I am sure, who have a full day of activities planned. We don’t spend a ton of time looking at binding, fretting and several other areas, but hopefully there will be time for that on another visit. The tour ends in a sort of showroom, where various guitars hang from the walls, just begging to be picked up. For some reason, I am in an SG frame of mind. I played several of them on the shop floor, and there are a few more examples here. Masseto winemaker Axel Heinz, a super-talented, classically-inspired guitarist, and I take turns running a few guitars through their paces. Sensing our interest, Koehler retrieves a few more SGs that have just come off the line. It is fascinating to compare models with different bodies, finishes and electronics. The last guitar is a re-issue of the 1961. In the late 1950s and early 1960s, sales of the Les Paul guitar were sluggish. Gibson decided to completely remake the Les Paul into a lighter instrument with two cutaways and easier access to the upper frets. Koehler shows us the original drawings for the 1961 Les Paul, which look incredibly sleek and modern, even today, after all these years. Les Paul hated the 1961 when he saw it. 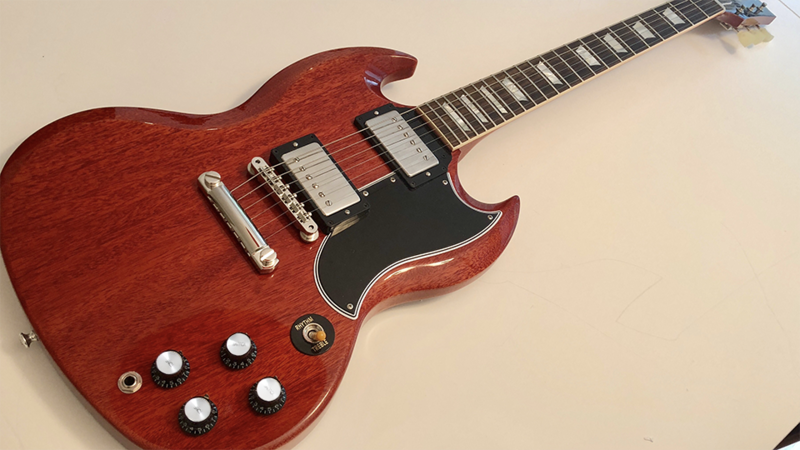 Gibson ultimately re-named the new model SG (Solid Guitar) in 1963 and reverted to the old design for the Les Paul, which re-entered production around 1968. The SG went on to become one of the most iconic guitars in the world. Eric Clapton, Robbie Krieger of the Doors, Tony Iommi of Black Sabbath and Frank Zappa all played SGs, but AC/DC’s Angus Young gave the SG unprecedented visibility on stage and on video. The moment I pick up the 1961 re-issue I know I have to have it. One of my rules of thumb for electric guitars is that they have to sound great acoustically. This guitar screams with tone and volume. And then there is that neck. Wow. Flat, fast and with low action. A dream. So, what wine shall we have? 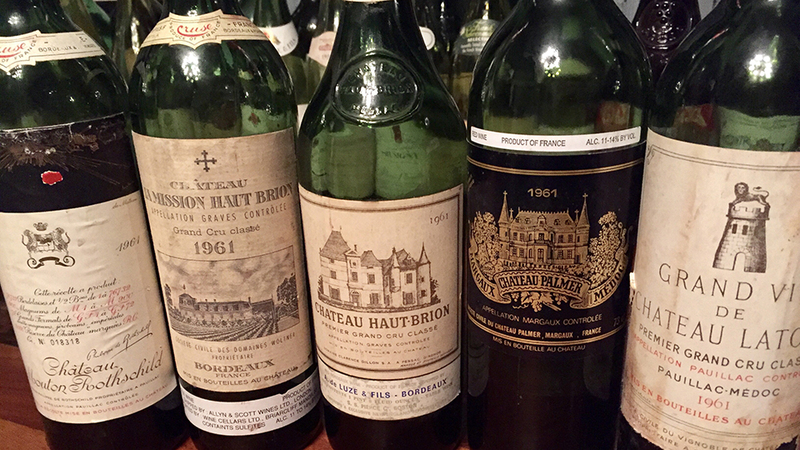 It has to be 1961 Bordeaux, of course. I vote for Latour…. I would like to thank our hosts Gibson Guitars, Mat Koehler, The Nashville Wine Auction, Holly Whaley, Pam and Steve Taylor and Martina and John McBride for a truly unforgettable weekend.